Well, my day job continues to eat my life, leaving precious little time left over to do much else. I do keep plugging away on the Clarke’s Law sampler. I finished out the small panel of narrow bands on the right, and am working on the border defining the bottom edge of the similar space on the left. I have to admit that I’m very bored with this narrow strip. 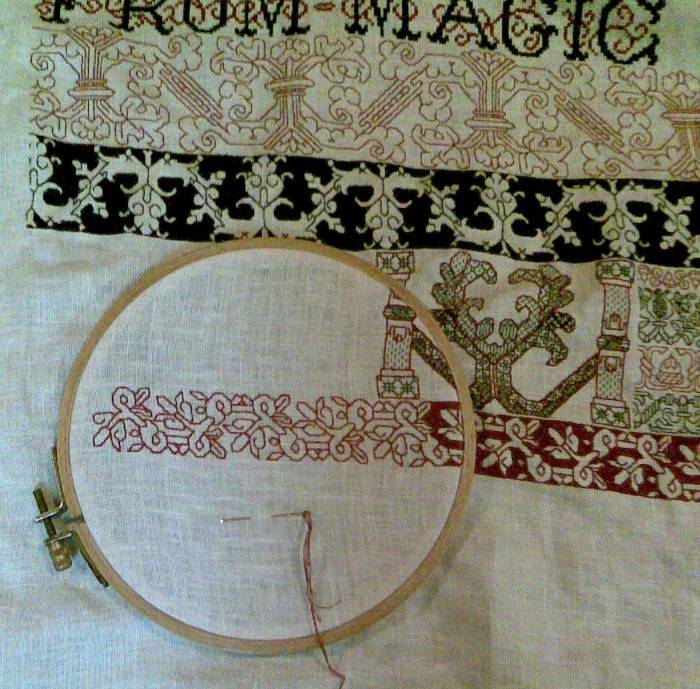 It’s LOTS of repetitions of the SAME unit, with LOTS of long armed cross stitch background to fill in. I am sincerely looking forward to when this band is over and done with, so I can move on to the next bit of fun. For Eleanor, who wanted to see the source material for the current band, it’s here. Fourth strip up from the bottom. I wish I could read the V&A accession number on the label in the photo. The set of narrow bands in the blank space immediately above the bit I’m working now will be different from the ones on the right of the center motif. There will be four and they’ll alternate between black and red, but they will be of different widths than their counterparts, with the narrowest on the bottom rather than on the top. Apologies to the few remaining readers here. This project has bored everyone but me to tears. Thank you for putting up with it. I’m highly impressed by your ability to keep plugging away at things.